Basil ‘Manenberg’ Coetzee, saxophonist, flautist, blowing up a storm as he always did. It’s February 2. Basil Coetzee’s birthday today. He would have been 73 years old had he not succumbed to cancer back in 1998. He was just 54 then and probably at his most creative as a musician. It was such an exciting time in his life too. He had found his “inner self” as he told me in an interview back in 1983. He was put on a pedestal, idolised even, because of his contribution to Abdullah Ibrahim’s (Dollar Brand) seminal work, Manenberg, which featured Basil’s very moving sax playing. 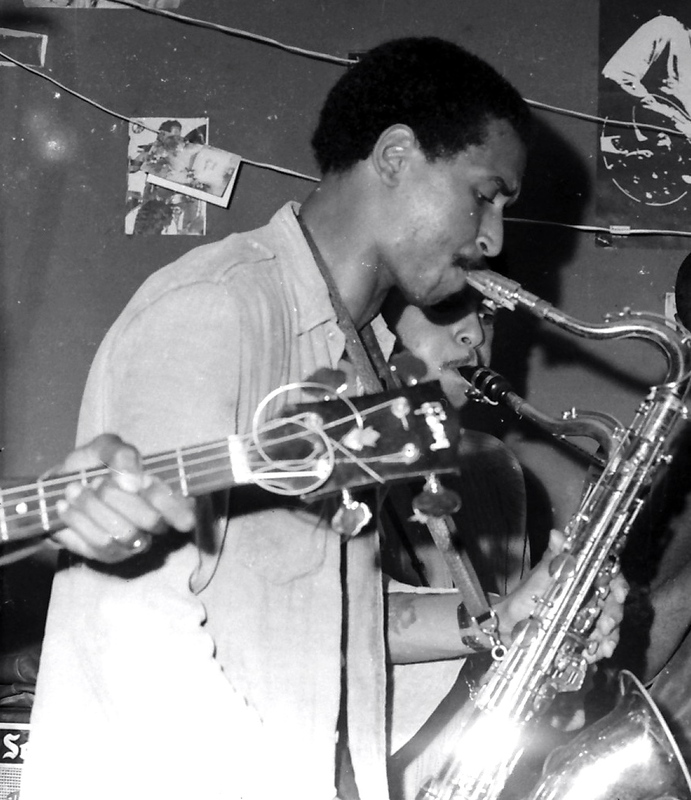 Some say it wasn’t so much Dollar’s hypnotic keyboard rhythms that made Manenberg the rallying cry of the turbulent times of student unrest on the Cape Flats in the Seventies and Eighties, but Basil’s strident, raunchy tones on his tenor sax. It was a pure township sound that people identified with. It was Basil’s sound. Although he was born in Bloemhof Flats in District 6, when that community was dispossessed, Basil and wife Mary went to live in Manenberg. Bleak,desolate, barren Manenberg. But it gave us Basil “Manenberg” Coetzee. Basil, and his good friend Robbie, fired up the huge protest crowds that filled Civic halls around Cape Town with Manenberg. The tune reached anthem status. I first met Basil back in May 1970 when he joined Respect, then the trendsetter group that thrilled fans with the more serious sounds of Blood Sweat and Tears, Chicago, Clapton’s Cream and Spooky Tooth. It was here he first teamed up with Issy Ariefdien and Jack Momple. Then he was simply “B’ to one and all. The original Pacific Express group formed in the early Seventies. At the back from left are, Paul Abrahams (bass), James Macdonald, (trumpet), Jack Momple (drums) Issy Ariefdien (guitar), and Basil Coetzee. Seated in front are Georgie Carelse, Vincent February and Robbie Jansen. 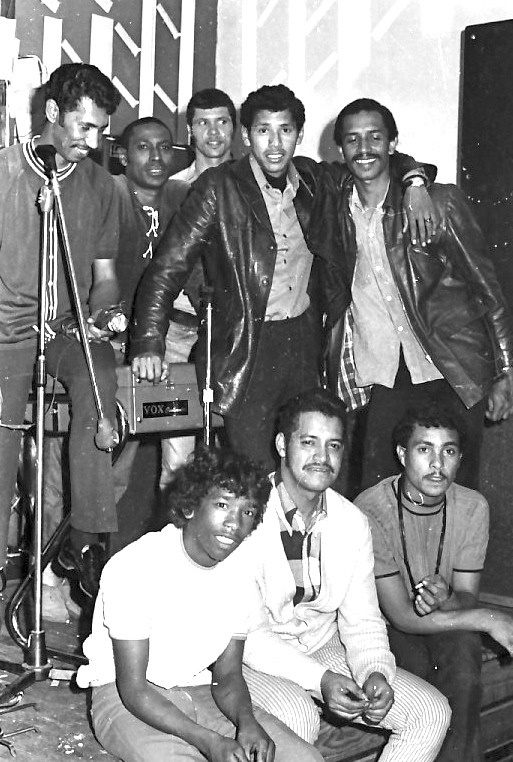 February played horns briefly in the group but was rhythm guitarist in The Pacifics, the group that preceded Pacific Express. Express developed something of a cult following as a jazz-leaning band but Basil moved on. 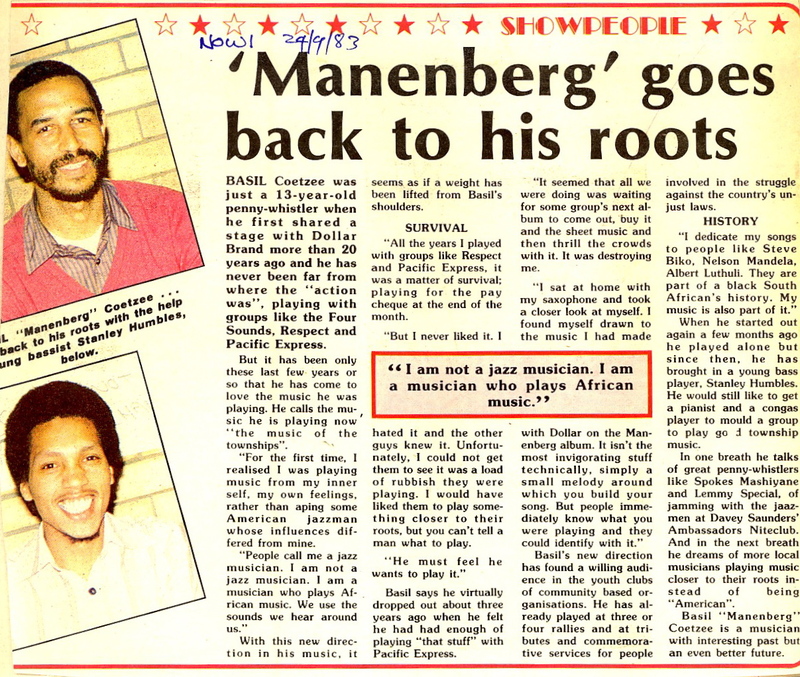 The Manenberg album with Dollar, recorded in 1974, had stirred something inside him and he did some serious soul-searching about his music direction. He admitted that he never really liked the music he played with Respect and Express. That was more than 30 years ago when he spoke out. I still seem to be hearing that sentiment today. Hilton Schilder said virtually the same thing in his interview recently. Basil’s “conversion”, as it were, gave us three albums in his name — Sebenza, Monwabisi and B. That is part of his legacy. We should honour. it. 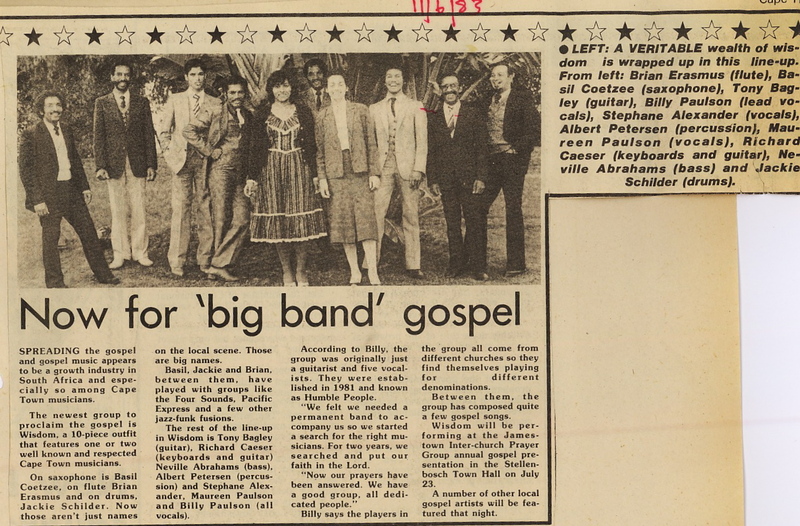 Basil Coetzee opens up in an interview in 1983, revealing he did not want to be known as a “jazz” musician. Click on the image to enlarge the type. And here’s a picture for posterity. Basil Coetzee is second from left. Check the others in the caption. Click on the image to enlarge the type. Warren, the chap in the middle was the rhythm guitarist for the original Pacifics. He ended up playing a few sax licks, before leaving the band. Knew his name back then, but totally forgotten now. Nice one, Henri. NOw I’m going to be lying awake in the middle of the night, trying to remember his name. Great musos great music! As a nipper I remember my late sister Kay, her late friend Val, Audrey, your wife, and a couple of other groupies had T shirts printed with the RESPECT across the front. Then in later years in a different era my friends, younger siblings and many more became fans of the Pacifics. So grateful to have been witness to the entertainment these guys provided! Nice tribute to Ou B – and that bit at the end of the song where Dollar/Abdullah says “Julle kan New York toe gaan, maa’ o’s bly innie Mannenburg”, was directed at Morris Goldberg who also played alto, alongside Ribbons. He was off to NY not long after the recording. I spoke briefly to Rashid Vally, the producer, about the fact that he wasn’t credited on the record. And if you listen carefully, you can hear Morris and Ribbons playing harmonies whilst B solos. Also the pic of the woman on the cover of the LP, is one that was taken by Abdullah during a visit to Morris’ old housekeeper, in Manenburg. Ironically it was Abdullah who went to live in New York, not long after the recording. I still want to hear the story of the bassist, Paul Michaels, I think, who seems to have dropped out of music completely after that. I think the album was also released abroad as “Cape Town Fringes”, but not completely sure. Otherwise its good to read these gems from the past. Shotto to you too Rafs. Glad to have you fact check my stuff. It’s part of the story that has to be documented. The album is such a signal moment in Cape Town and South Africa’s musical history that it is nice to know the finer details behind it. I’ll get around to doing something on Paul Abrahams as I knew him. Maybe I should tap in Jack’s memory banks while he has has some of it to tell me stuff about Paul. Thanks again for the comment. It is much appreciated. Shotto!!!!!!! True story about New York – uncanny indeed! I cannot thank you enough for bringing the music of the Cape scene I missed having immigrated to Canada in the 60’s back to me now to enjoy. I typically go to YouTube to hear some of their music. Loved Basil’s number Monwabisi – brilliant rock jazz. Great music came from the musicians there at that time in the Cape. I just watched Abdullah Ibrahim (Dollar Brand) recount of the making of Mannenberg – worth a view. I’m so glad to hear all these praises about O’B…..and our pioneers of Cape Town that are legends in their own right.The Cape Sounds live on in these write ups and comments.Thanks Mr W.Ludski.B Jnr. Awesome articles Warren, I salute you for accentuating our local artists who impacted all of our lives during those apartheid years. I only read these articles tonight as I was scrolling to send a pic of my late dad to a friend. Thank you !